Entonox (mixture of 50% oxygen and 50% nitrous oxide) is effective and safe analgesic agent used for many years in different clinical conditions. Entonox is a rapid-acting inhalatory analgesic agent with central mechanism., The most common side effect of entonox is transient nausea and headache., The efficacy of entonox for pain relief has been evaluated and approved in the previous studies for many clinical conditions. However, there are few studies about the efficacy of entonox in acute renal colic. After all, till now, no optimal drug regimen for pain relief in renal colic patients has been introduced. In this study, we aimed to compare combination of fentanyl + nitrous oxide with fentanyl + oxygen, as analgesic agents in patients with acute renal colic secondary to urolithiasis. 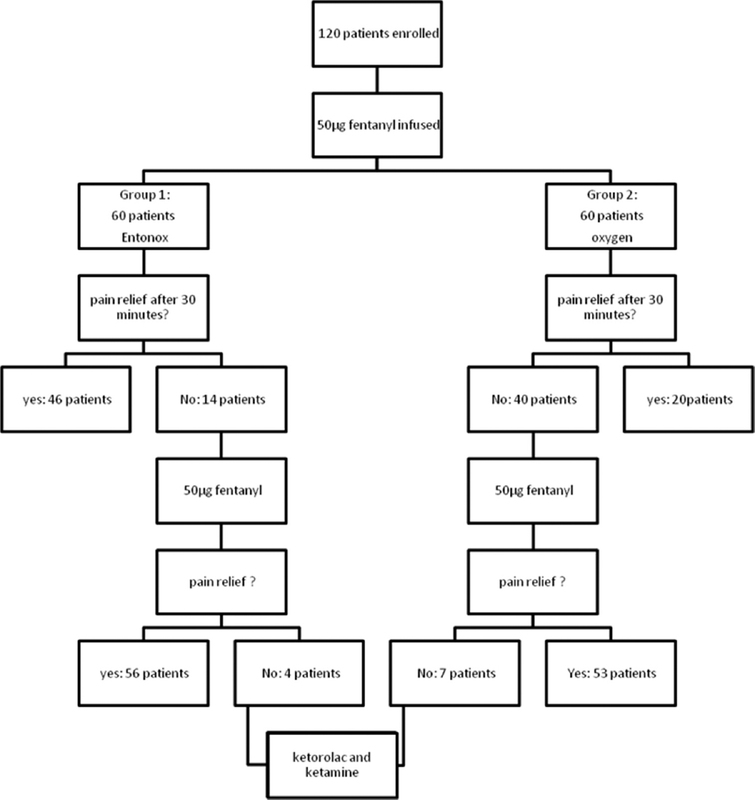 This prospective double-blinded clinical trial was performed in the emergency department of Alzahra and Kashani Hospitals in Isfahan, Iran, between April 2015 and March 2016. The study design was approved by the Ethics Committee of Isfahan University of Medical Sciences, and all patients gave informed consent before taking part in this trial (IRCT code: IRCT2013020512369N1). Using sequential sampling, we included a total number of 120 adult patients with acute renal colic, presenting to the emergency department of our center, during the study period [Figure 1]. Inclusion criteria are as follows: age >18 years, high probability of renal colic diagnosis based on clinical signs and symptoms, stable hemodynamic (pulse rate = 60–100, systolic blood pressure >100, blood oxygen saturation level [SPO2] >90%, respiratory rate = 8–22), no use of analgesics during the last 24 h, absence of these conditions in patients history: asthma, chronic obstructive pulmonary disease, intestinal obstruction, hypertension, heart failure, history of previous surgery on kidney and urinary tract, peptic ulcer, gastrointestinal bleeding, previous history of allergy to fentanyl or other analgesic agents, loss of consciousness, head or chest trauma, pneumocephalus, pneumothorax, drug abuse, retard menstruation, abdominal tenderness, rebound tenderness or guarding, and fill informed consent form. Patients were excluded if the patient hemodynamic becomes unstable during the process of hospitalization, hypersensitivity reaction to analgesic drugs occurred, and the diagnosis was changed during the further investigations. In the beginning, 50 μg fentanyl was infused for all the patients. The proper dose of fentanyl is 1–2 μg/kg, but due to the condition that patients were resenting from pain and also need of urgent action, we infused 50 μg fentanyl for all patients. Before admission before the intervention, each patient was given a number based on a coincidental computer-based random digit generator. Afterward, according to this random numbering, we divided our patients into two groups: Group 1 (fentanyl + entonox) who had received odd numbers and Group 2 (fentanyl + O2) who had received even numbers. Group 1 inhaled gas of cylinders with number 1 labeled on them; Group 2 inhaled gas of number 2 cylinders. These cylinders appeared quite similar in shape, size, terms, and conditions and only differed in their contents and number. Group 1 was received mask of entonox and Group 2 was received mask of oxygen. Neither the patient nor the interviewer did not know which cylinder was contained which drug. Only supervisor was aware of this issue, but he was not involved at the time of the intervention. Quantitative measurement of the pain was performed according to visual analog scale (VAS), before the intervention and after 3, 5, 10, and 30 min of that. Pain scores were based on a standard 10-cm VAS. For numeric measurement of pain, patients were asked to give a number from 0 (completely painless) to 10 (the worst pain that has been experienced). Patients were asked to remove the mask if their pain was relieved. If the pain was not relieved after 30 min, 50 μg fentanyl was infused again and then pain severity was measured again by VAS. Finally, if the patient was still suffering from pain, another usual pain-relieving agents such as ketorolac and ketamine were administered to decrease the severity of patient's pain according to the patient's status and if there was no contraindication for usage of ketorolac and ketamine. Patient's demographics as well as information about the patient's condition such as location of pain, family history of renal stone, and vital signs were obtained before the hospitalization. After all, data about the dosage of fentanyl and duration of hospitalization were recorded. The duration of hospitalization and severity of pain at specified times (at admission and 3, 5, 10, and 30 min after the intervention) were measured and compared between patients in two groups. For pain relief consideration, VAS score should have reduced 3 score or changed to mild. All the statistical analyses were performed by SPSS V.19 (Chicago, IL, USA). The duration of hospitalization and pain scores were compared within groups by independent samples t-test. For analyzing of pain changing process, repeated measure ANOVA test was used, and to assess the analysis of qualitative data, Cochrane and McNemar's tests were obtained. Cox regression and log-rank test were used to compare the time for renal colic pain to get better between groups. P < 0.05 was considered as a statistically significant. A total of 120 patients were enrolled in the study and then randomly assigned to two study groups, each containing 60 patients (Group 1 received fentanyl + entonox and Group 2 received fentanyl + O2). Patient's demographics are summarized in [Table 1]. Mean age of patients was not shown any statistically significant differences between two groups (P = 0.79). Further, gender distribution of the patients was not significantly different between two groups (P = 0.19). The mean (standard deviation) time of hospitalization was 211 (59) min in Group 1 and 236 (61) min in Group 2. T-test showed that the differences were statistically significant (P = 0.024). The pain scores after the intervention are also demonstrated in [Table 2]. Repeated measure ANOVA test showed that in both groups, the pain severity was decreased, and the pain severity change was statistically significant (P< 0.001). In addition, according to independent t-test, comparison of pain score between two groups showed that the decrease in pain severity after 10 and 30 min in fentanyl + entonox group was significantly greater than fentanyl + O2 group, (P = 0.002 and 0.001, respectively). However, the pain severity differences at other time of measurement were not statistically different (P > 0.05). Mean (standard error [SE]) of needed time for renal colic pain to get better was 11.27 (1.23) min in fentanyl + entonox group while it was 20.47 (1.71) min for fentanyl + O2 group. Further, median (SE) was 10 (0.62) and 30 (0) for fentanyl + entonox and fentanyl + O2 groups, respectively. 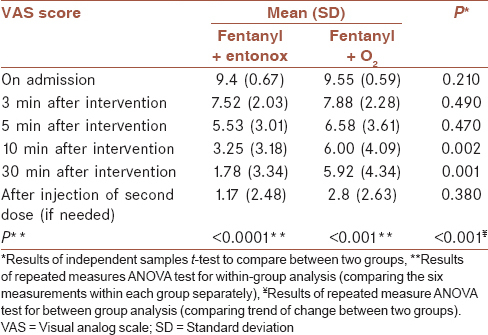 Log-rank test showed the needed time for fentanyl + entonox group was statistically lower than fentanyl + O2 group (P< 0.001) [Table 3] and [Figure 2]. Number of patients relief from pain (according to what patients said about their pain) is summarized in [Table 4]. Cochrane test showed that in both groups, trend of change of the proportion was statistically significant in both groups (P< 0.001). McNemar's test showed that the proportion in fentanyl + entonox in second, third, and fourth measurements was significantly more than fentanyl + O2 group (P = 0.036, P < 0.001, and P < 0.001, respectively) [Table 4]. The decrease in pain severity after 10 and 30 min in fentanyl + entonox group was significantly greater than fentanyl + O2 group, as well as needed time for renal colic pain to get better, likewise the proportion of patients relief from pain. Pain management in the hospital has become an important issue since the last years, especially in emergency service. In this setting, pain is indeed the first cause of access and physicians need to know how to manage and relieve it and estimate timing and safety of pain-relieving agents. An effective and safe strategy for the pain management should have two features. First, analgesic drugs should not cause negative effects on chronic syndromes such as renal failure, coronary artery disease, and heart failure. Second, these drugs should not interfere with concomitant treatment, including antiplatelet drugs.,,, In this study, we aimed to compare the efficacy of entonox + fentanyl versus O2+ fentanyl in the management of renal colic pain in emergency department (ED). Entonox leads to rapid and effective analgesia with less sedation. Entonox may be associated with adverse effects such as nausea and vomiting, dizziness, dry mouth, and buzzing in the ears in few patients ranging from 0% to 30%. Nitrous oxide may cause cardiac depression and should be used with caution in patients with congestive heart failure and in those with chronic obstructive airway disease. Entonox causes suppression of the central nervous system as well. Nitrous oxide (the effective agent in entonox) contributed to opioid system of the brain, particularly medial thalamic area and spinal cord, that have a lot of morphine-sensitive cells., Entonox can be as effective as fentanyl in pain relieving with similar rate of side effects. A recent clinical trial performed by Kariman et al. showed that inhalation of entonox is an effective and safe analgesic regimen for acute renal colic and is more potent in relieving renal colic pain in comparison with morphine sulfate. The present study is the first randomized clinical trial study that compares the effect of O2 versus entonox on pain relieving of patients with renal colic. Fentanyl was prescribed for both groups due to ethical considerations. In this study, we found that combination of entonox and fentanyl is more effective in decreasing hospitalization time and reducing the pain than combination of O2 and fentanyl in patients. Furthermore, the rate of pain relief by entonox and fentanyl was more rapid than that by O2 and fentanyl. Both combination therapies showed a significant process of healing according to pain severity during 30 min. For those patients with no significant relief in their pain after 30 min, second dose of fentanyl was infused. After second-dose infusion, 11 patients were still suffering from severe pain. There were four patients in Group 1 and 7 patients in Group 2. These patients were received another pain-relieving agents such as ketorolac and ketamine [Figure 3]. For fentanyl infusion, the patients should be weighted that due to patients' condition, it was not possible to do that and we infused 50 μg fentanyl for all of them. VAS is subjective and pain relief in drug abusers may be different in comparison with general population and it can cause bias. Fentanyl + O2 administration is limited as constant temperature and appropriate ventilation is required and this condition preparation is not possible in ED. This study showed that entonox is more effective than O2 on decreasing the hospitalization duration and reducing pain in renal colic patients. As this study is the first study in which combination of entonox and fentanyl is experimented, further studies are necessary. We are grateful to Alzahra and Kashani Hospitals' head office, security, and their emergency officials, nurses, and employees. The study was sponsored by Isfahan University of Medical Sciences. Shokeir AA, Abdulmaaboud M. Prospective comparison of nonenhanced helical computerized tomography and doppler ultrasonography for the diagnosis of renal colic. J Urol 2001;165:1082-4. Worcester EM, Coe FL. Clinical practice. Calcium kidney stones. N Engl J Med 2010;363:954-63. 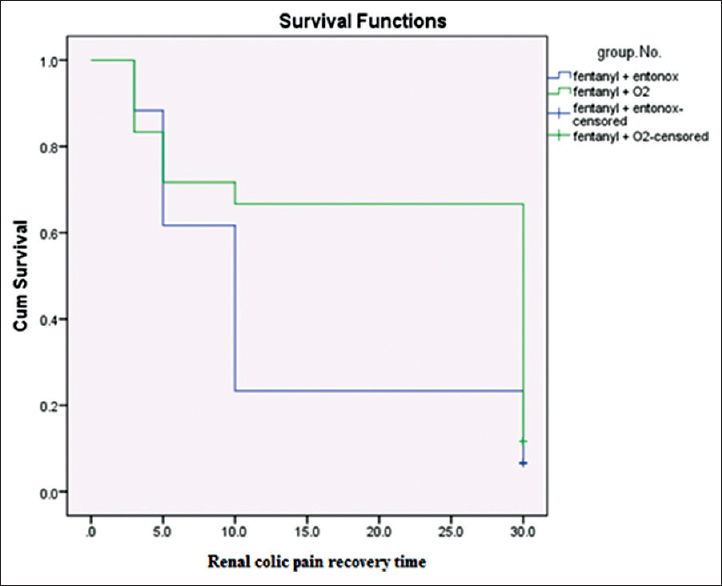 Esmailian M, Keshavarz M. Synergistic effects of citalopram and morphine in the renal colic pain relief; a randomized clinical trial. Emerg (Tehran) 2014;2:26-9. Majidinejad S, Esmailian M, Emadi M. Comparison of intravenous ketamine with morphine in pain relief of long bones fractures: A Double blind randomized clinical trial. Emerg (Tehran) 2014;2:77-80. Kariman H, Majidi A, Taheri S, Shahrami A, Hatamabadi HR. Analgesic effects of inhalation of nitric oxide (Entonox) and parenteral morphine sulfate in patients with renal colic; A randomized clinical trial. Bull Emerg Trauma 2015;3:46-52. Singh A, Alter HJ, Littlepage A. A systematic review of medical therapy to facilitate passage of ureteral calculi. Ann Emerg Med 2007;50:552-63. Bornemann-Cimenti H, Wejbora M, Szilagyi IS, Sandner-Kiesling A. Fentanyl for the treatment of tumor-related breakthrough pain. Dtsch Arztebl Int 2013;110:271-7. Belkouch A, Zidouh S, Rafai M, Chouaib N, Sirbou R, Elbouti A, et al. Does intranasal fentanyl provide efficient analgesia for renal colic in adults? Pan Afr Med J 2015;20:407. Gyulai FE, Firestone LL, Mintun MA, Winter PM.In vivo imaging of nitrous oxide-induced changes in cerebral activation during noxious heat stimuli. Anesthesiology 1997;86:538-48. Wee M. Analgesia in labour: Inhalational and parenteral. Anaesth Intensive Care Med 2007;8:276-8. Young A, Ismail M, Papatsoris AG, Barua JM, Calleary JG, Masood J, et al. Entonox® inhalation to reduce pain in common diagnostic and therapeutic outpatient urological procedures: A review of the evidence. Ann R Coll Surg Engl 2012;94:8-11. Masood J, Shah N, Lane T, Andrews H, Simpson P, Barua JM, et al. Nitrous oxide (Entonox) inhalation and tolerance of transrectal ultrasound guided prostate biopsy: A double-blind randomized controlled study. J Urol 2002;168:116-20. Bryson EO, Frost EA. Preoperative addiction-clinical management of the addicted patient. 1st ed. New York: Springer, 2012. Chaper 9: Marijuana, nitrous oxide, and other inhaled drugs; p. 163-77. Yildiz S, Uzun G, Kiralp MZ. Hyperbaric oxygen therapy in chronic pain management. Curr Pain Headache Rep 2006;10:95-100. Wilson HD, Toepfer VE, Senapati AK, Wilson JR, Fuchs PN. Hyperbaric oxygen treatment is comparable to acetylsalicylic acid treatment in an animal model of arthritis. J Pain 2007;8:924-30. Mazdak H, Abazari P, Ghassami F, Najafipour S. The analgesic effect of inhalational entonox for extracorporeal shock wave lithotripsy. Urol Res 2007;35:331-4. Kosiński S, Siudut B. Pain treatment in the emergency department: What do patients think?. Anestezjol Intens Ter 2011;43:234-8. Breivik H, Cherny N, Collett B, de Conno F, Filbet M, Foubert AJ, et al. Cancer-related pain: A pan-European survey of prevalence, treatment, and patient attitudes. Ann Oncol 2009;20:1420-33. Shau WY, Chen HC, Chen ST, Chou HW, Chang CH, Kuo CW, et al. Risk of new acute myocardial infarction hospitalization associated with use of oral and parenteral non-steroidal anti-inflammation drugs (NSAIDs): A case-crossover study of Taiwan's National Health Insurance claims database and review of current evidence. BMC Cardiovasc Disord 2012;12:4. Benyamin R, Trescot AM, Datta S, Buenaventura R, Adlaka R, Sehgal N, et al. Opioid complications and side effects. Pain Physician 2008;11:S105-20. Franceschi F, Iacomini P, Marsiliani D, Cordischi C, Antonini EF, Alesi A, et al. Safety and efficacy of the combination acetaminophen-codeine in the treatment of pain of different origin. Eur Rev Med Pharmacol Sci 2013;17:2129-35. 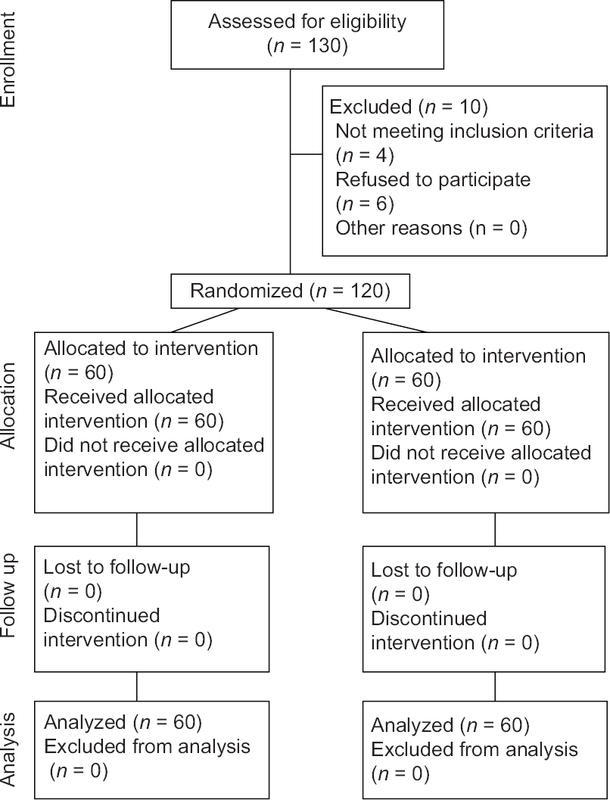 Nauta M, Landsmeer ML, Koren G. Codeine-acetaminophen versus nonsteroidal anti-inflammatory drugs in the treatment of post-abdominal surgery pain: A systematic review of randomized trials. Am J Surg 2009;198:256-61. Gorgas DL, McGrath JL. Vital sings measurement. In: Roberts JR, Thomsen TW, Hedges JR, eds. Roberts & Hedges clinical procedures medicine. 6th ed. Philadelphia: Elsevier Saunders; 2014. p. 20-2. O'Sullivan I, Benger J. Nitrous oxide in emergency medicine. Emerg Med J 2003;20:214-7.